Looks like we’ve made it to Week Two! We’re still working out the kinks in the site, so please let us know if you encounter any problems, or just plain don’t like the way we do something. Also, we realized we plastered links to our Patreon campaign all over the page, and just sort of assumed you’d know what Patreon was. That’s our bad. You’re probably already familiar with crowdfunding platforms like Kickstarter or Indiegogo. Dead Gentlemen Productions, working with Zombie Orpheus Entertainment, has successfully funded several projects through Kickstarter, including JourneyQuest Season Two, and The Gamers: Hands of Fate. Through these sites, people pledge support for a project at different reward levels and receive varying levels of swag in return. It usually involves paying in advance for a copy of the final product, whatever that might be. It’s a great system for big, one-time projects like films and webseries. But a webcomic’s a different sort of project. There’s no set end date where the comic is done, and we can’t ask you to prepay for a product that’s years away from being finished. We’re still delivering it; just one page at a time. 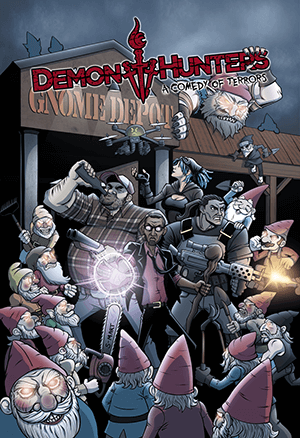 Let’s take a look at the scale of the Demon Hunters comic. The first story—Back from the Dead—will be 42 pages long. That’s a little longer than a typical, printed issue of a comic book, but there’s a lot of story to squeeze in there. Back from the Dead is just the first story in a larger, five-issue story arc. And that story arc is, in turn, part of a five-volume series that will tell Gabriel’s story from start to finish. We’ve got a roadmap for this thing, but there’s no way it’ll fit in the glove compartment. Kickstarter just isn’t built for ongoing projects like Demon Hunters. Fortunately, there’s an alternative model. Patreon lets you become a patron of Demon Hunters, pledging smaller amounts on a recurring basis. You’re not just a backer, you’re a patron of the arts! Ever wanted to feel like a 15th-century Medici? Well…that’s really weird. You’re weird. But anyway, this is about as close as you’re gonna get. In return for your patronage, you get access to behind the scenes info, concept art, exclusive content, special events and more depending on your pledge level. Plus, the more patrons who support Demon Hunters, the better this site gets for everyone as we hit our Milestone Goals and more and more features get unlocked. In just a week, we’ve already unlocked a monthly column from Brotherhood historian and time-traveling “archaeologist” Kentucky Blue Clay thanks to the support of just seventeen awesome patrons. Our ultimate goal is to be able to churn out two, or even three pages of comic each week, so we can really get this story moving along! So if you like the comic, and want to help out, please consider becoming a patron. Even as little as a dollar a month helps get us closer to our goals. We’ve got an awesome story to share with you all, and we’d rather not take ten years to tell it! And a huge Thank You to everyone who’s already a patron! We had no idea we’d get that kind of support in the first week! You’ve definitely got us fired up and working hard to do you proud!